"German resistance is entirely disorganized. The only coherent movement Nazis have in this part of Europe is eastward, and everyone is heading that way acting under nothing but his own orders to get away. One British armored unit reported that they have found German troops mixed in with the civilians of the liberated villages of Belgium—Germans and Belgians cheering the Allied advance. 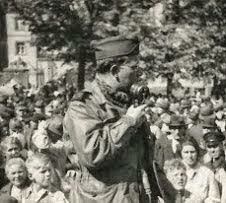 Follow-up units stop the Germans from cheering when they are taken prisoner." "Another reason the Belgian people want revenge is the methods the Rexists used to protect themselves. Every Rexist carried with him a list of five names of suspected Belgian patriots who were to be shot as hostages in case the Rexist was shot. The White Army learned of these lists and kept on shooting Rexists, but they switched the lists of hostages, putting in the names of five collaborators to die instead. It worked in several instances where collaborators were shooting each other." "The paper Free Belgium prints a column of classified advertisements worth repeating. Incidentally, the editor of this paper is published as 'Peter Pan.' The address is given as the former German headquarters. It seems that the Germans were never able to locate the exact spot where the paper was published. This column, printed as a joke, gives some interesting sidelights on the Nazi occupation of Belgium. One advertisement says: "German woman, very wealthy, wishes to marry a Belgian, any Belgian. Accepting nationality in exchange." Another reads: "For sale: 15,000 false identity cards. Price: 50 francs." A third reads: "Will exchange 5,000 photographs of Goebbels for five of Churchill." "The homes of collaborators are still being ransacked and burned. Odd persons are still being rounded up by the Belgian White Army. I saw a young man today bringing in one of them—an elderly man with his hands tied behind the back. As the White Army man produced the collaborator along the street with his rifle, crowds along the sidewalks hissed and booed." "The Germans are trying to filter through the extended Allied lines, but not many are getting out, chiefly because they simply do not have the transport to carry them—and it is a long walk back to Germany." "There was a black market for everything. American phonograph records could be purchased from people who had regular traffic to Spain. The film "Gone With the Wind" was shown secretly a number of times here. The price of seeing it was something like $20 a ticket." "This soldier said a lot of things about Adolf, including gossipy bits such as that no one ever knows when Hitler is going to feel like, and everyone from Field Marshals down to batmen have to wait to see the Fuehrer's mood before they approach him. And the batman, who should know, said that Hitler's lady friend back in those days was a beautiful stenographer. For after all, Adolf is a dictator." "But as you approach the front in the more newly liberated towns, you run into the feeling of vengeance and the signs of the magnificent efforts of the people to help free themselves. In one village, we stopped for coffee—ersatz coffee—at a restaurant. When we went in, we found that it was being used as headquarters for the Belgian White Army there. The men wore their uniforms of cream-colored coveralls and black berets. They all had rifles and pistols and knives. German grenades stuck out of their belts. They had been working and fighting all night, and many were asleep at the tables catching a few moments of rest before their next mission." "Model admitted that Germany had lost the battle, but he added that Germany would still win the war, explaining that he could not say any more than that now. He called on his soldiers to believe in their luck. He ordered strict discipline and pointed out that the Belgian and French patriots would rather shoot a weak looking man than a strong one. He urged his soldiers to retreat walking along erect to impress the Belgian and French citizens." "For a mile on both sides of the canal you could see the zigzagging fortifications built by the Belgians in a futile attempt to extend the ill-fated Maginot Line to the sea. Although the main defenses of the Albert Canal point northwards, it is also defended on the south bank as well. In this way, segments of the canal could hold out. However, the Germans were so surprised that they could not use these defenses." "The German casualties have been so heavy and replacements so inadequate that the Nazis have aided our victory to a great extent by their extravagant use of men under do-or-die orders.For example, after one of their counterattacks failed against the Geel bridgehead yesterday, a fanatical Nazi jumped on top of a truck in full view of the British troops and shouted: "I want to die for Hitler!" The British troops fulfilled this Nazi's last wish." "These are the Germans from the bottom of Hitler's manpower barrel who the Nazi leaders hope will save their skins for them and, somehow, defeat the Allies and throw them into the sea. Although this seems ridiculous to us, it is taken very seriously by the Nazis. And the German soldiers, even the inadequately trained total soldiers, continue to fight with determination." "We went to a base airdrome to find fighters and fighter-bombers already running a shuttle relay back and forth to the front, preparing the way for the airborne troops. It was perfect parachute weather; the sky was blanket gray. A haze restricted visibility to three or four miles, just enough to allow the pilots to keep themselves on course and for the troops to see where they were dropping. There was enough haze to keep any enemy aircraft from spotting the planes as they came in." "We've been flying straight into Holland now for something like twenty minutes, so far without any opposition; at least none that I have been able to see. Our fighters are down, just almost nosing along the hedge rows, searching the little villages, and they're up above us and on both sides." "As the dive-bombers struck, Cronkite was in a jeep with his old UP pal from Kansas City, bespectacled CBS Radio correspondent Bill Downs, the reporter that Murrow had wanted Cronkite to replace in Russia. Cronkite and Downs were driving near the Philips Electric works complex when bombs began falling. They jumped out of the jeep and vaulted over a tall fence into a park. There they huddled behind chopped-down trees as bombs pounded all around. Neither knew how, but they became separated." "Working under enemy shell-fire, the assault boats were assembled. When they were put into the water, another difficulty arose. The tide was moving, but with a downstream current of eight miles an hour. Some of the boats drifted 300 yards down river before they were retrieved and brought back. Meanwhile machine guns spluttered on the opposite bank and German artillery kept smashing the embarkation area regularly." "Examining the bodies of the supposedly dead Germans, they found one 15-year-old Hitler youth—a paratrooper kicked him as he groaned—underneath him he hid an automatic rifle." 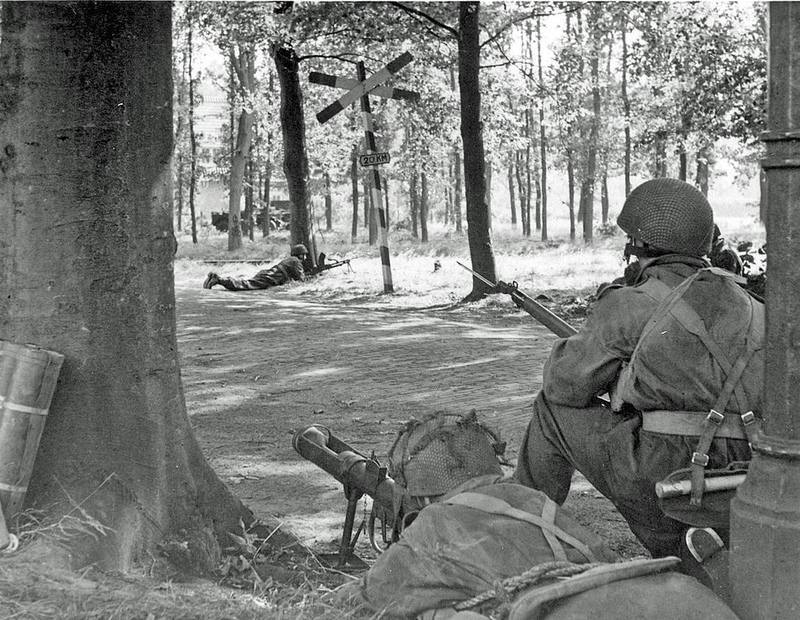 "Polish paratroopers dropped south of the Rhine several days ago are fighting alongside the tanks and infantry of the British Second Army, and together they secured a firm foothold on the south bank of the Lower Rhine near the town of Oosterbeek. There once was a ferry crossing, but the Germans destroyed it last week." "It seems that the Presbyterian mind of the average American cannot accept the fact that any group of people can coolly sit down and decide to torture thousands of people. And if torture isn't enough, then to kill them as calmly as an ordinary person would swat a fly. This refusal to believe these facts is probably the greatest weapon the Nazis have, and it will operate in the post-war judgment of the Germans—wait and see."